How do you like your coffee? 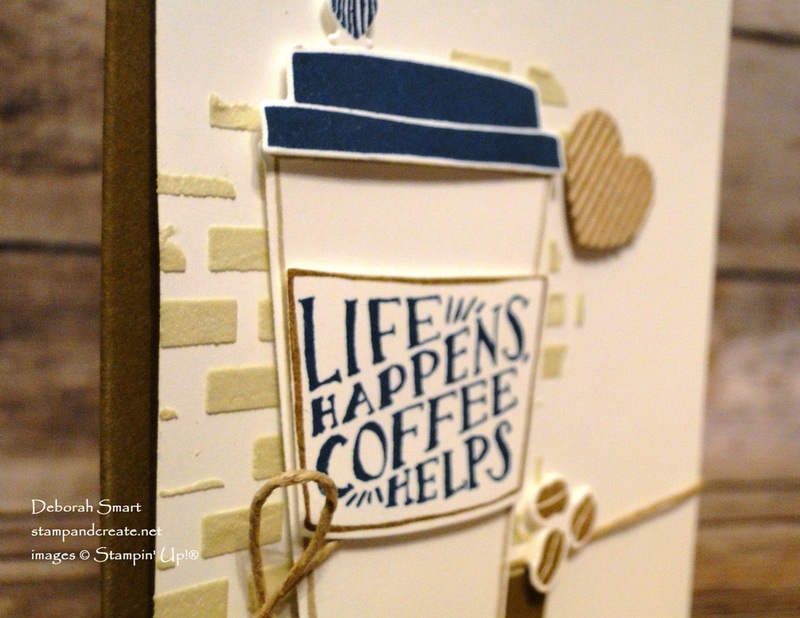 My answer would be ‘strong, and often!’ I love my coffee, so when I saw the new Stampin’ Up! Coffee Break Suite, I thought I’d gone to heaven! This week’s Paper Craft Crew sketch challenge PCC249 gave me a great idea to combine this suite, plus another of my new favourite products. It’s very faint behind the focal image (circle), but can you see the texture behind it? I immediately knew that I wanted to incorporate the new Embossing Paste into my project! First I created my background, using a panel of Whisper White cardstock. I put a dollop of Embossing Paste onto my Silicone Craft Mat, and added 1 drop of Crumb Cake ink from the Ink Refill bottle. Using the Palette Knife, I mixed the ink into the paste until the colour was consistent throughout the paste. It was really quick & easy – the embossing paste is very light & fluffy; not hard to mix at all! I placed the brick pattern Pattern Party Decorative Mask on top of the cardstock, and applied the embossing paste. I didn’t want the entire panel covered, so I just applied it where I wanted it to show. I love how you can achieve entire coverage, or leave ‘partial’ bricks, like I did on my panel. While the embossing paste was drying (it dries within minutes! ), I stamped the rest of the images onto Whisper White cardstock, in preparation for die cutting. The cup outline is stamped in Crumb Cake ink, the wrap outline and coffee beans in Soft Suede; the sentiment, lid and heart (for the spill stopper) were stamped in Dapper Denim ink. The Coffee Cups Framelits Dies make cutting out all the pieces so fast! My Big Shot is really getting a work-out with all the fabulous Bundles in this catalogue! You can see how easy it is to layer the pieces of your coffee cup together. Before attaching the cup, wrap a length of Linen Thread around the panel, and tie it off with a bow. 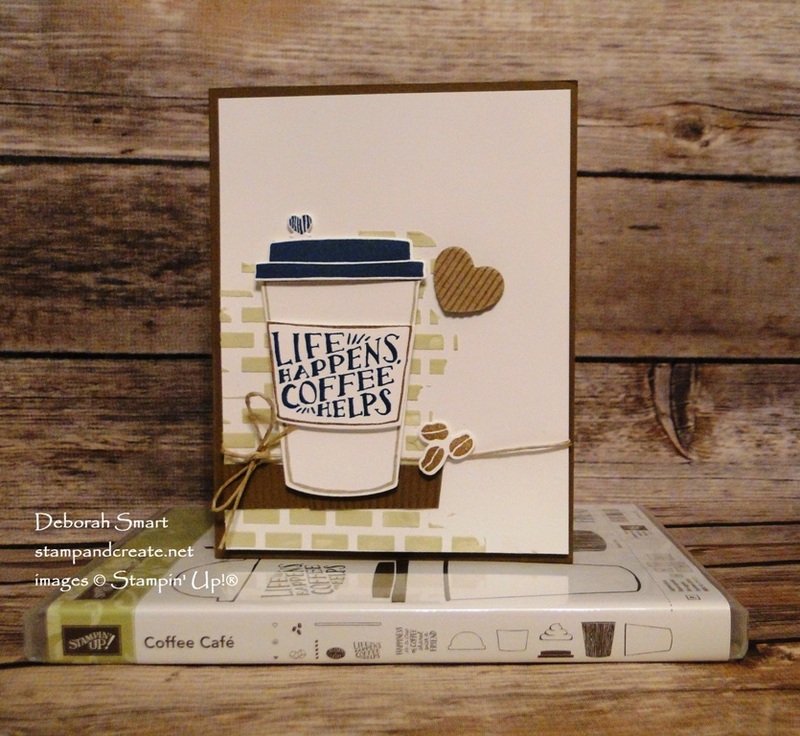 The cup pieces are layered using Stampin’ Dimensionals, including the coffee beans and the cute heart from the Corrugated Elements. There are so many pieces to use with this Suite! Can you see the length of Soft Suede cardstock behind the cup? I use the cup wrapper die, which embosses the corrugated look at the same time it cuts! Then I just add a piece of it behind the cup. Now it’s your turn to join in the challenge! First, check out what the rest of the Design Team have created, over on the Paper Craft Crew blog. Then, link up your own card for the challenge. Want to make your own card like mine? Click on the images below to order the products I used to create my card. Then you’ll be ready to create your own! Previous Previous post: A Little, A Lot, or All of It? Next Next post: More Coffee Please! This is a great card, Deborah! I love all the little extras – especially the brick wall. So cute. Great card Deb. Being a big coffee lover myself that set really appealed to me too although it’s still on my wish list. Loved the way you made the cup your focal and used the embossing paste to bring out those barista style bricks. Awesome! You’ll love playing with this set when you get it, Penny! I can’t wait to see what you create 🙂 Thanks so much for visiting, and leaving your message! Darling card Deborah! I haven’t gotten the embossing paste yet, but am loving the samples. Great approach to this sketch!